Custom home design, consulting, pre-design, site planning, remodels, interior design, art acquisition, finish and furniture selection and more. Commercial architecture, pre-design, site design, space planning, permit and construction drawings, bidding services, value engineering and more. Interior design, thematic color plans, space planning, design detail specifications, finish and furniture selection, art acquisition and coordination. Permitting, community outreach, value analysis and engineering, construction administration and management and energy efficiency design. The ultimate design should be an expression of those who will live, play, or work in and around the spaces we create. Siteline’s years of living and working in historic Nevada City and Grass Valley helps to envision and complete prominent projects that are part of a lasting future community. Siteline Architecture projects satisfy client needs, local ordinances, and neighborhood aesthetics. With over forty years of combined experience, Siteline Architecture has a keen understanding of the region’s unique environment and consistently works to merge the community vernacular with current construction practices for sustainability. Where do you want to live, work and play? In examining preliminary design perimeters, Siteline works actively with clients to establish their lifestyle, budget and site planning needs. Siteline’s input helps to guide the process, identifying all key requirements early in the planning phase, saving time and money while getting focused. A strong vision, with a realizable plan of action. The core task of a schematic is to establish a vision, with a fluid scope of work. Schematics let Siteline work with you to identify, refine and establish the very best direction for your project. This phase may include a site plan, renderings and in some cases, a floor plan. This provides Siteline with enough information to spell out our working agreement moving forward. Preliminary design and schematics lay the foundation for solid design development. Design development integrates the elements established in early planning and adds design components, like doors, windows, and finish suggestions. Typically design development is where floor plans, elevations and full dimensions are presented for review. Construction documents invite the builder into the conversation. With floor plans and specifications set, construction documents communicate clearly with contractors and builders the exact requirements of your project. 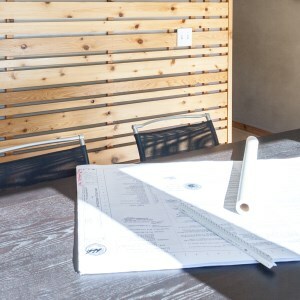 Construction documents are a set of final drawings that include all pertinent information required for a contractor to price and build your project. We work with the Contractor to build your project to specification. The architect’s core responsibility during this phase is to help the contractor to build the project as specified in the construction documents, as approved by the owner. We are there with you, the entire way, from concept to completion.